I can be, shamelessly, a slightly nosy person. I love blog posts and Youtube videos showcasing things that are usually kept secret. Show me a “What’s in My Bag” video and give me a glass of chardonnay and I am a happy camper. 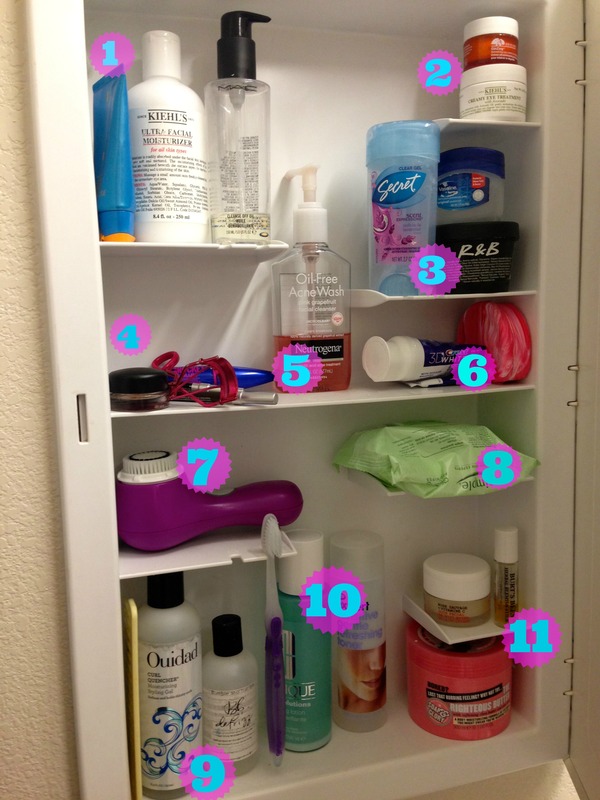 It’s probably the beauty product junkie in me, but I especially love to see posts on the contents of medicine cabinets. I enjoy them so much that I decided to make my own post about my medicine cabinet so other nosy people can check out some of the products that I use often. 1. Some skin care necessities. SHISEIDO Ultimate Sun Protection Cream+ Broad Spectrum SPF 50+ For Face (left) to protect my pale Irish skin. Kiehl’s Ultimate Facial Moisturizer, (center) a must-have for the drier winter months. MAC Cleanse Off Oil, (right) the best for taking off stubborn eye makeup. 2. Kiehl’s Creamy Eye Treatment with Avocado (bottom), my favorite thick eye cream to use at night. ORIGINS GinZing Refreshing Eye Cream (top), perfect for making me look wide away in the morning. 3. Secret Scent Expressions in Ooh-La-La Lavender (left), using a clear gel is good if you’re wearing darker colors like I often do in the winter. LUSH R&B (bottom), I use this to tame my hair back when I wear ponytails or braids. Vaseline (top), this works well on super dry skin. 5. Neutrogena Pink Grapefruit Facial Cleanser, this product smells so good, but I’m actually not crazy about the results. I’ll probably go back to using the Philosophy Purity Cleanser once I’ve used the Neutrogena up. 6. Crest 3D White Toothpaste (left) I love this product and I think it works well. To the right is my retainer is in its girlie pink case. 7. My trusty Clarisonic Mia2, this face brush is incredible and using it has really improved my skin. 8. Simple Cleansing Facial Wipes on the rare days when I wear foundation or other makeup products on my face, I use these to ensure that I get rid of every last trace of makeup. 9. A comb is an essential to any girl with curly hair. Mine (left) is infused with macadamia oil, so as I comb through my tangles it works to hydrate my hair. Ouidad Curl Quencher is what I use to enhance my curls on days when I’m embracing the genetic gift/curse of curly locks (thanks Dad!). A product to prevent frizz is a basic need for my hair whether I’m wearing it curly or straight. Currently I’m using the Bumble and bumble Defrizz. Once I’ve finished the product I want to try Moroccan Oil because my hairstylist says it works well for people with dry hair like me. 11. At night instead of my Kiehl’s moisturizer I use the Korres Wild Rose + Vitamin C Advanced Brightening Sleeping Facial (top left) which I love. I use the Burt’s Bees Herbal Blemish Stick (top right) as a spot treatment when my skin breaks out. The Soap & Glory The Righteous Body Butter not only smells amazing, but also has been such a savior for my dry skin this winter. That’s everything that I keep in my medicine cabinet! What are some of your everyday must-have products?